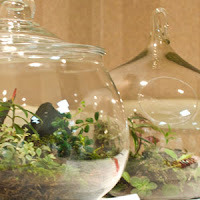 Class 63 Terrarium, curved - not to exceed 24" in any dimension. Entry No. 270, Terrarium - curved, exhibited by Karyn Cichocki. Score: 96. First Place. Entry No. 321, Terrarium - curved, exhibited by Jill Fischer. Score: 92. Second Place. Entry No. 200, Terrarium - curved, exhibited by Neale W. Stuart-Merriman. Score: 87. Third Place.